Okay, so my last post was inaccurate... well, wrong. And Aza said we'd be wrong on the first pass. So I'm not worried. This naturally leads me to consider ways where I could refine and iterate my sketch of the experience and to highlight more accurately the value that the Public Radio Roadtrip holds for listeners and for stations. And while this first pass did paint a suggestive experience, and one that does fall within the experience that one might have using the Public Radio Roadtrip, I wanted to be up-front in pointing out that everything I described in these initial sketches could be pretty much done without using the app itself. I didn't want there to be any smoke and mirrors here. I did not want to expend people's time and attention on an incomplete picture... that wouldn't get me any closer to selling the experience (although I will say that the experience of getting QR Codes of public radio stories out into the world is exciting to me). So, with that in mind, let me describe a very simple approach for associating QRCodes with radio stories. This approach is so simple that everyone can and should give this a try, and then they should walk outside and take these stories out into the physical world for others to find. For example, let's say you're a grocer. Let's say you want to entice people to pay a little extra money to buy some of your savory hydroponic tomatoes from Canada. Then, you search for Tomoato. You find the perfect article about why tomatoes don't taste like anything and you find that it mentions hydroponic tomatoes from Canada. Great! Now, you right-click on the download link for the story and select "Copy Link Address". 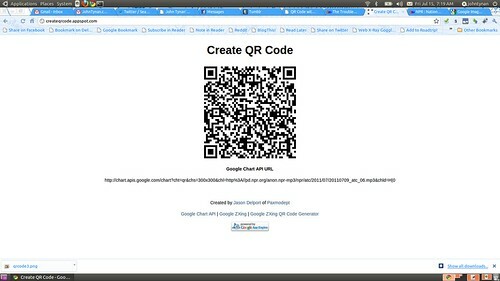 Next, in another tab or browser window, go to createqrcode.appspot.com. 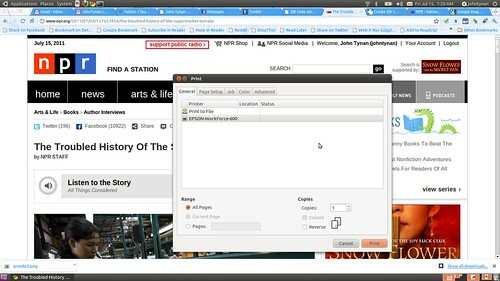 Then, paste the link to the audio story that you just copied into the textarea at createqrcode.appspot.com. 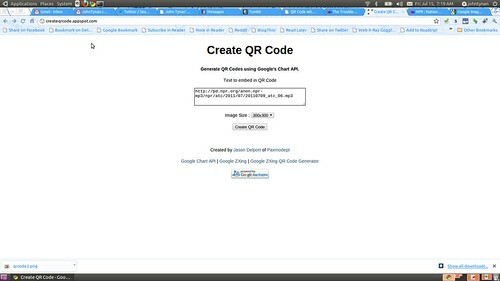 Then, click "Create QR Code". Voila! You got it. Now, print this page. 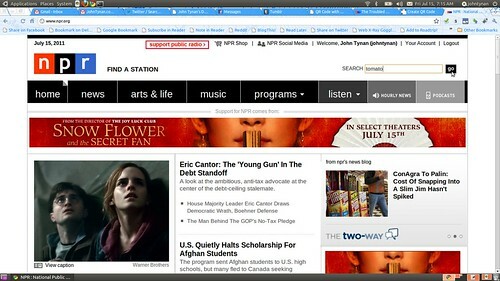 While you're at it, print the page from NPR. 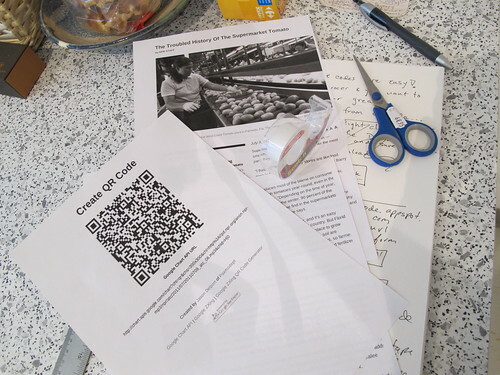 Then, using some scissors, cut around the QR Code on the printed page. 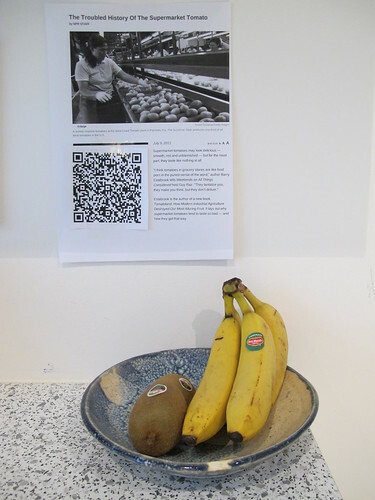 Then, using some tape, paste the QR Code to the printed article. Finally, take your poster out into the world and tack it to a pole or post it to a community bulletin board (or in this example, by a tomato display at your business). Now, people can use their smartphones to scan the QR Code and listen to the story, right there where they find it, wherever they find it, out in the world!